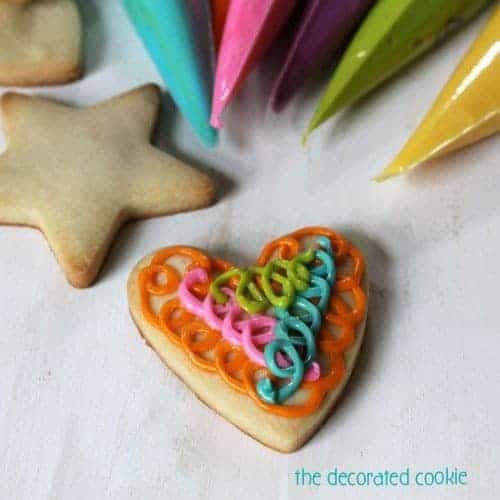 VEGAN COOKIES: The BEST recipes for vegan sugar cut-out cookies and vegan decorating icing. 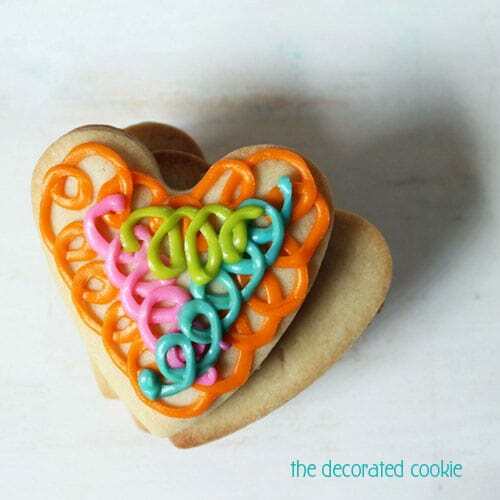 I feel rather confident declaring these the best vegan cookies (cut-out sugar cookies, but really of all cookies ever) and vegan decorating icing in the universe, not having ever left this world, because my picky daughter gobbled up about five of these. And she’s REALLY picky. And they taste so good, especially with the icing. AND, they keep their shape beautifully. Gorgeously. Amazingly. 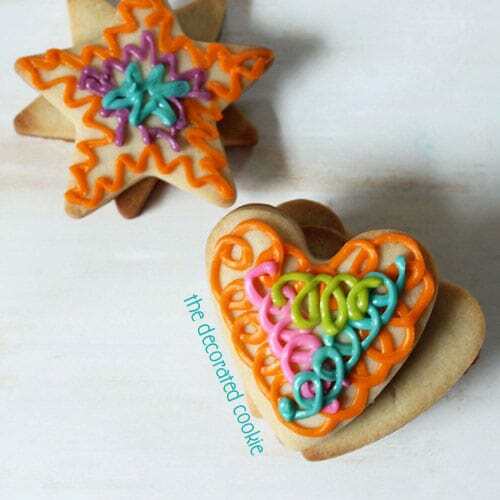 I donated a cookie decorating activity to my daughter’s school auction. The pre-K class won. The snag, they have a child with a nut allergy and a child allergic to eggs and dairy. And icing is made with egg whites. As the children were all sharing the icing bags and so as to not single out two children, having reserved, isolated, dairy-free icing bags was not an option. 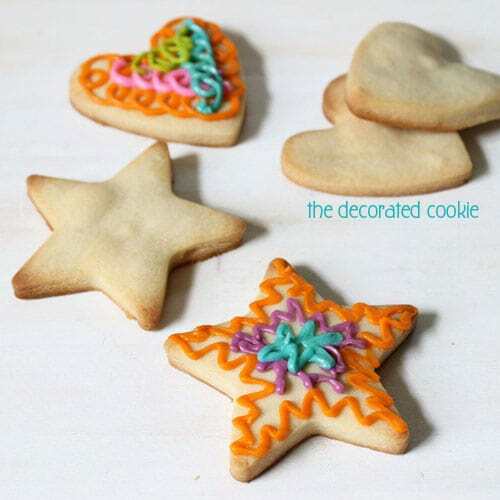 Scroll to the end for the recipes, and find all of my cookie decorating recipes (including this one) HERE. 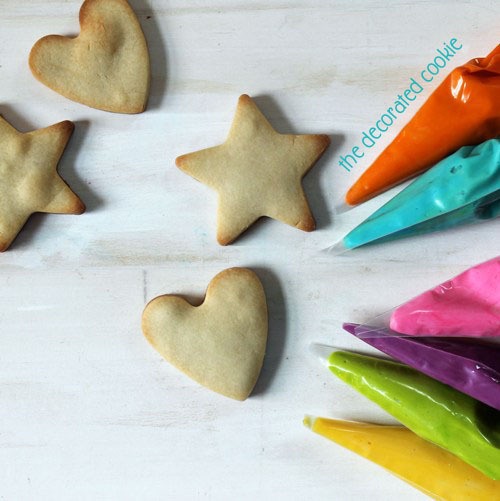 I tried several recipes I found online for vegan cookies, and I found none worked as well as I like, so I ended up just using my never-fail, favorite cut-out sugar cookie recipe and substituting vegan ingredients, and then creating a simple, vegan cookie icing. For an egg substitute, I found ENER-G Egg Replacer at a natural foods store. It’s a powder that comes in a box. Chances are this is in the baking aisle of Whole Foods, but I didn’t know to look there when I stopped there first. For a butter substitute, I found earth balance vegan buttery sticks from the natural foods store but also more widely available, had I looked more thoroughly. Powdered sugar is the tricky one. I’ve read that powdered sugar is processed through bone char, made from cows, to whiten the sugar. Eew. So I got the organic powdered sugar from Whole Foods. Given the organic sugar is more ecru than bright white, I’m making an educated assumption the organic isn’t filtered through the bone. I just couldn’t find confirmation of this on the packaging or online anywhere. If anyone out there has any more information on the organic powdered sugar, feel free to send along! 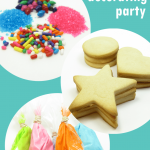 • Not allergy-related, but useful: Skip the couplers and tips for kids, just fill decorating bags with icing, close tightly with rubber bands and snip about 1/2-inch from the tip. And now, on to the vegan recipes. I made these for the kids’ cookie decorating activity for the child allergic to dairy and eggs, but these are a fabulous, (slightly healthier?) recipe for anyone who follows a vegan diet. With a handheld electric mixer or in a standing mixer with the flat beater, cream together the vegan buttery sticks and the sugar. Add the egg mixture and blend. Mix in the vanilla, scraping down the sides of the bowl as needed. Mix the flour and salt with a whisk and gradually blend into the wet mixture. Place the dough in a Ziploc bag and refrigerate for two hours. (TIP: You may also refrigerate up to three days, just let the dough sit at room temperature enough to soften until pliable.) Briefly knead a chunk of the dough on a floured surface, roll about 1/4 inch thick, cut out shapes and place on a parchment paper-lined baking tray in a preheated 375 degree oven. Bake for 12 to 18 minutes, depending on the size of the cookies. Cookies are done when the edges are golden. Let cool completely before decorating. Makes about 25 to 30 cookies, or 15 large cookies. TIPS: I found the Ener-G egg replacer at the natural food store, which for fellow DC folks, means Yes! Organic Market. I also found the buttery sticks there, though you may be able to find those at Whole Foods. Mix all ingredients with a whisk or in with the wire whip in the standing mixer. Add more powdered sugar or soy milk, alternatively, to get the desired consistency. Divide, tint and fill decorating bags for decorating. If left at room temperature, uncovered, overnight, these will harden enough to handle. Meaghan this post is so near to my heart. As a parent of a son with a peanut allergy I hate being “that parent” and my kid being “that kid.” I wish more people would embrace your attitude when dealing with children with food allergies. Exactly! Seriously, you have to read my friend’s book. It changed how I view the entire universe of food allergies. So cute! While we are fortunate to have avoided food allergies, my kids all have friends and we have a cousin with a life-threatening allergy. Great tips! 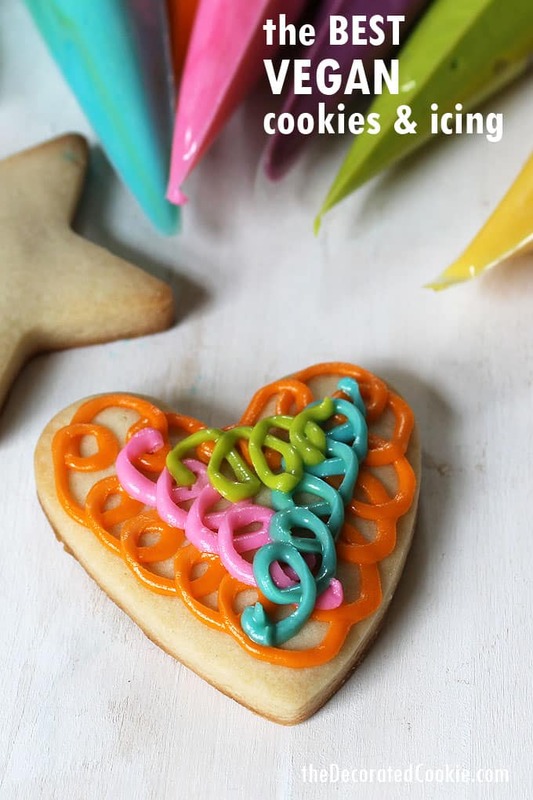 The photos make these cookies look like they have lumps or bubbles on them, which wouldn’t make for a good decorating surface. Are my eyes deceiving me? NOpe, Julianne, a couple had the bubbles. I’ve made them before and zero bubbles. I just overkneaded those. I can’t tell you how happy I am that you posted this, I’ve been searching for a vegan recipe, but was always nervous how it tasted. You have saved me!! 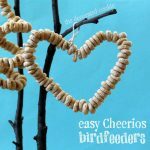 🙂 I have friends who have dairy allergies & my daughter has nut allergies, so this blog is very heart warming to me. Thank you for being understanding & so considerate!! I will definitely be passing this on to my vegan friends!! I just found this site today and wanted to thank you for this amazing recipe! My daughter has peanut,dairy and egg allergies and every other cookie recipe I have tried didn’t cook correctly until now! I didn’t use ENER-G because I wasn’t near a Whole Foods so I used apple sauce instead. We made Christmas cookies tonight so thank you so much for making that memory happen! YAY! That just made my morning!! Thank you so much, Kelsey. So glad they worked out for you. Also… next time, instead of running out to the store, I’m going to try applesauce. Brilliant! I love the cookie recipe, and though the icing recipe is vegan and allergy free, it really isn’t healthy with the use of corn syrup. Corn syrup is a terrible sugar substitute that’s too overused. Vegans are typically very health conscious people who wouldn’t be thrilled with the notion of putting that (or crisco for that matter) in their bodies. I don’t want to come across as rude, because like I said I truly did love the cookie recipe! Thanks Lindsay! I understand that vegans are health conscious, definitely, but I’m also a believer in “everything in moderation.” So I, for one, don’t have a problem with the occasional indulgence. I’m also a big believer in NOT assuming everyone who eats dairy-free is synonymous with “must be super healthy.” For those vegans that eat dairy free for purely health reasons, I agree, this is not the cookie for them. 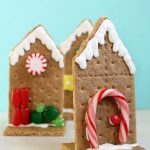 I am sure there are plenty of great, healthy cookie recipes out there, and I encourage them to go in that direction instead of visiting my blog. 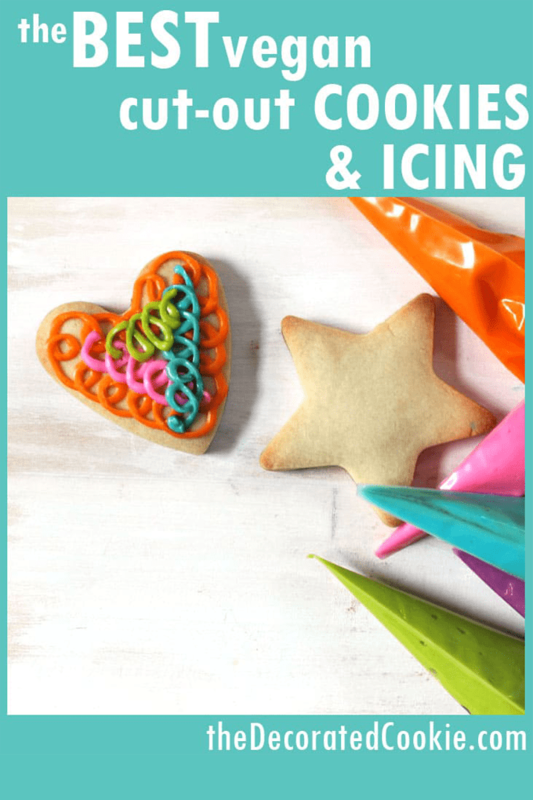 However, for those vegans who eat vegan for other reasons (allergies, morals, personal preference), and sometimes just want to indulge in a great cookie, or who want their allergic kid to get to have a treat sometimes like the other kids, well… this recipe is for them. Also, as for the corn syrup. While I agree, that downing sugar isn’t, um, healthy, “light corn syrup,” as used in the recipe is NOT the same as “high fructose corn syrup,” the super unhealthy stuff. I think that’s what you’re thinking of. The latter has been converted to fructose, which is not good for you. The former is 100 percent glucose. Is there any chance you know how many eggs = egg replacer? My son isn’t vegan, just has an allergy to dairy. For one egg, I used 1 1/2 teaspoons of Ener-G egg replacer mixed with 2 tablespoons of water. I found the egg replacer at a natural foods store, and I also believe that Whole Foods carries it. This looks like a great recipe. I plan on making these for a birthday this weekend. Thank you! These look great! Both my sons have food allergies, one is egg, soy, tree nuts & peanut, the other is egg & dairy! I always like to try new baking recipes for them & send them to day care, and other kids there have food Allergies as well. I don’t ever want my kids to feel left out on holidays & birthdays when someone has beautiful, fancy & yummy treats, so I do my best to make sure they always have something special for them too. Thank you for the recipe & for taking the time to take kids food allergies serious. It’s appreciated! Question: for the icing, do you think rice milk would work since one of my sons is allergic to soy? Hi Laurie, YES. Absolutely on the rice milk. That recipe is very forgiving. You can toss anything in there. And I agree about feeling left out. I have a friend who tells a story of birthdays as a child. Kids would bring cupcakes to school and she would eat hazelnuts instead. Very isolating, so I’m glad there are more and more options for kids nowadays! Still a long way to go though. Hi Marixa! Good question. If left to dry for several hours (or overnight), it will dry hard enough to handle and not be sticky. How great that you were able to fully include kids with food allergies safely! That’s wonderful. It takes additional thought and planning. I love the precautionary steps that you incorporated and shared. Thanks for sharing your tips with others regarding *how* you did so. As an allergy mom, it is hard to trust another person fully “gets” what is required to keep our kids safe. when cooking for them. Your thorough steps and recipe research show that you “get” it. I’m also looking forward to trying your recipe for the cookie and icing. My daughter is invited to a cookie exchange. Thank you so much Stef! Good luck with your cookies!! How about the color in the icing? I’ve made this recipe dozens of times and it always comes out great. Except now we are gluten free! Do you know if this will work with gluten free flour? Hi Leigh-Ann, Yay! That’s so great to hear! Unfortunately, I’ve NOT tried it with gluten-free flour. Because there are no leaveners in the recipe, I have a feeling it WOULD work, so worth a try I think.